Russula variata has a cap that is usually mottled with greens and purplish pinks--though a single color can sometimes dominate completely. 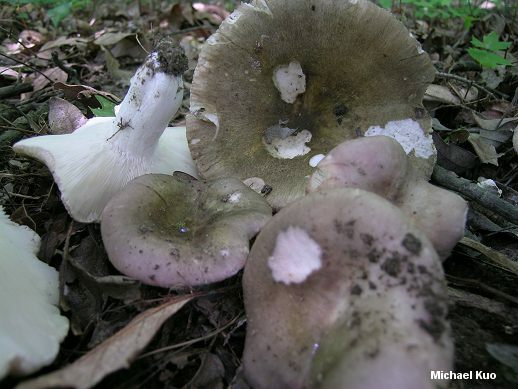 It is found under oaks and other hardwoods, primarily in eastern North America, and it features repeatedly forked, soft gills as well as a white spore print. The taste ranges from mild to somewhat acrid. 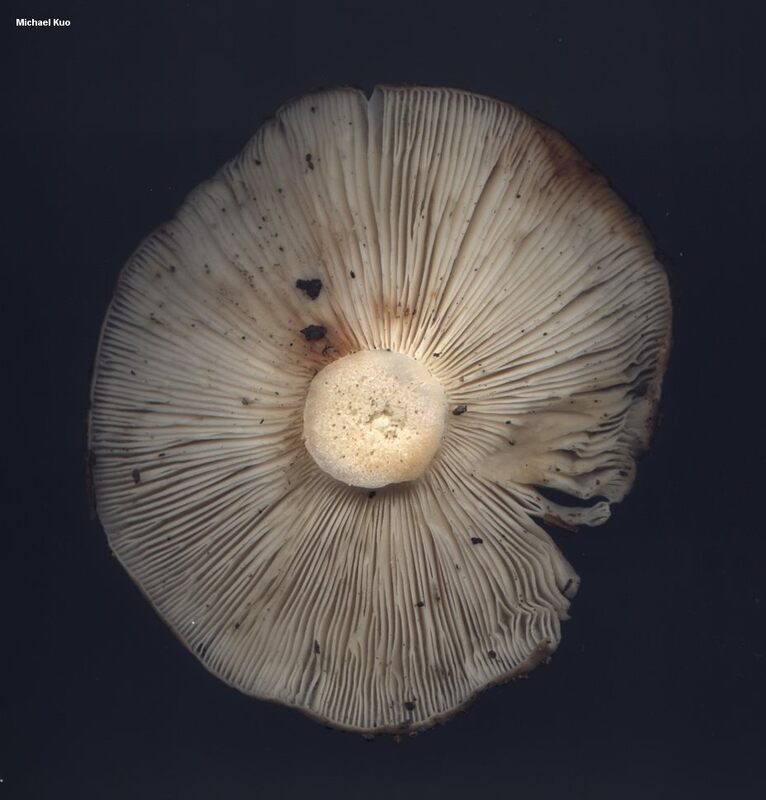 Russula cyanoxantha is very similar, but has gills that fork less frequently and a consistently mild, rather than acrid, taste. 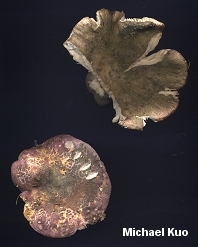 The two mushrooms are so similar that some mycologists have considered Russula variata to be merely a variety of Russula cyanoxantha. 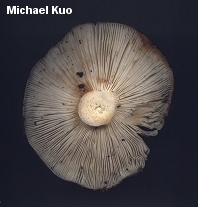 Ecology: Mycorrhizal with hardwoods, especially oaks--but occasionally reported (perhaps erroneously) under conifers; growing alone or gregariously; summer and fall; possibly widely distributed, but more frequently encountered in eastern North America. 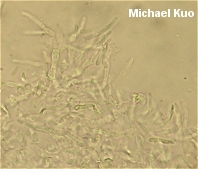 Cap: 5-15 cm; round to convex when young, becoming broadly convex to flat or shallowly depressed; dry or slightly moist; fairly smooth, or sometimes becoming cracked with age; green to olive green or purplish pink--or with these and other shades mottled; the margin sometimes slightly lined in older specimens; the skin peeling fairly easily, sometimes halfway to the center. Gills: Attached or slightly running down the stem; close or crowded; forking frequently and conspicuously, near the stem, near the cap margin, and in-between (enlarge the illustration for an example); white; occasionally spotting slightly brownish in age, but not bruising; when young soft, greasy, and flexible (un-Russula-like in this regard). 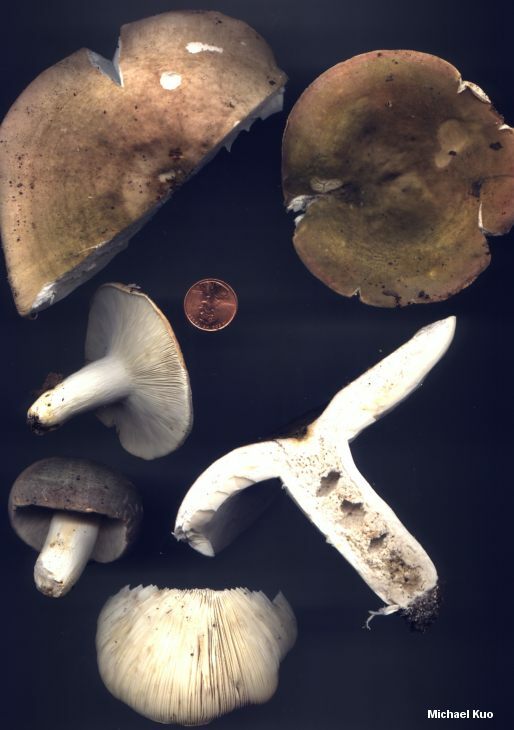 Stem: 3-10 cm long; 1-3 cm thick; white, occasionally discoloring brownish in places but not actually bruising; brittle; dry; often becoming cavernous; fairly smooth. Odor and Taste: Odor not distinctive; taste mild or, more frequently, slowly moderately acrid (be sure to include the gills in a taste test), becoming mild with age. Chemical Reactions: KOH on cap surface negative to orangish. Iron salts on flesh and stem surface negative. 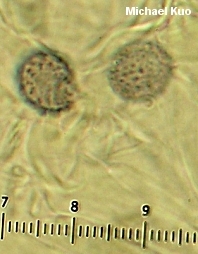 Microscopic Features: Spores 7-11.5 x 6-8 µ; with fairly isolated warts .3-1 µ high; connectors present but not forming reticula. 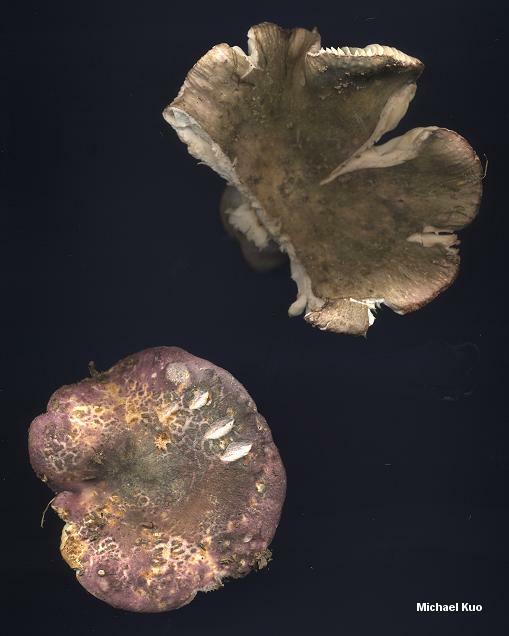 Pileipellis a cutis beneath a turf-like upper level of elements with variously shaped, slender tips; pileocystidia not clearly differentiated, but some hyphal tips and/or pseudocystidia may be positive in sulphovanillin; in KOH all pileipellis elements hyaline. REFERENCES: Banning, 1881. (Burlingham, 1915; Beardslee, 1918; Kauffman, 1918; Shaffer, 1970; Smith, Smith & Weber, 1979; Kibby & Fatto, 1990; Phillips, 1991/2005; Lincoff, 1992; Metzler & Metzler, 1992; Roody, 2003; McNeil, 2006; Kuo, 2007; Binion et al., 2008.) Herb. Kuo 06239509, 09030201, 06270807.